Beazer Homes USA Inc., a national homebuilder based out of Atlanta, is one of the top 10 builders in the country, with homes for sale in numerous states. They pride themselves on the construction of homes that meet and exceed Energy Star requirements, while still maintaining a wide range of price points and appealing to various demographics. And in addition to the energy savings, their homes can be personalized, using flexible floor plans and designed upgrades. 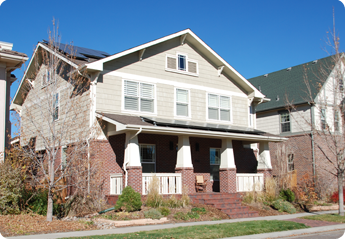 Although Beazer Homes no longer builds new properties in Stapleton, their existing homes can be spotted along the park between 25th Place and 25th Avenue and on some of the largest sites in the neighborhood. Their five floor plans range from 2,868 to 3,192 square feet and styles from Mediterranean to English Revival to Victorian.